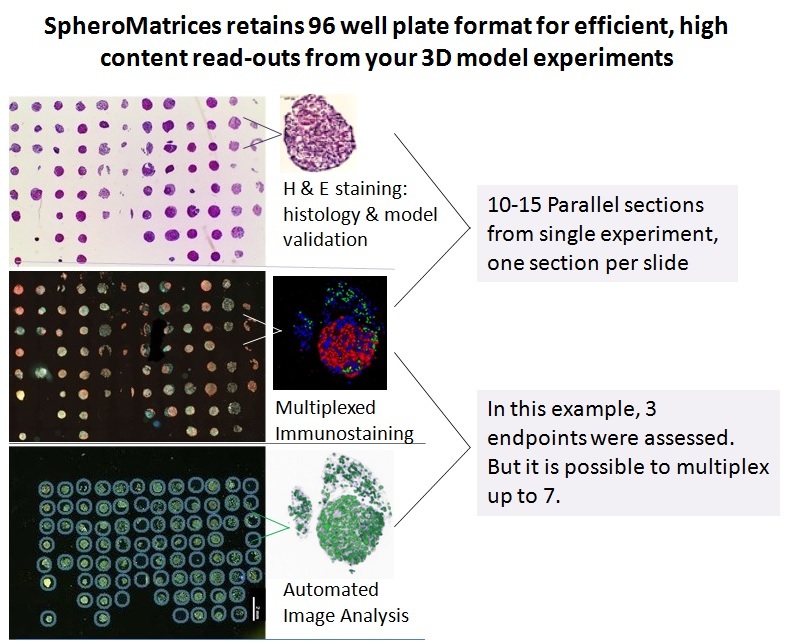 SpheroMatrices® spheroid tissue microarray (TMA) platform preserves the experimental layout of your 96 well plate making it possible to compare treatment groups within the same experiment . 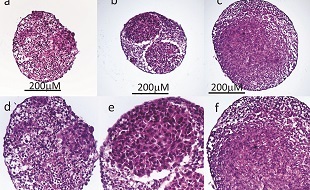 As the TMA sections are fixed, it is possible to perform Heat-induced Epitope Retrieval (HIER) on the samples without impacting upon the integrity of the tissue. HIER makes it possible to probe the tissues with antibodies for virtually any molecular endpoint, and with current multiplexing protocols e.g Perkin Elmer TSA Opal technology , it is possible to stain for up to 7 tissue biomarkers per slide. To illustrate the utility of the platform, an experiment in the 96 well format may consist of 8 treatment groups of 12 microtissues per group per plate. A SpheroMatrices TMA typically produces ~10 serial sections. Hence with 7 color multiplex staining it would be possible to quantify up to 70 different end points across the array: 7 biomarkers x 10 slides = 70 endpoints per experiment over 8 different treatment groups (n=12). With SpheroMatrices, you will optimize the value contained within your 3D model.